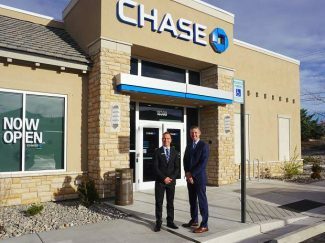 Michael Doray, branch manager of Chase Bank's new Reno location, and Sean P. Herron, market director for the Northern Nevada and California region of JPMorgan Chase & Co., in front of the new branch. As Northern Nevada continues to see explosive growth, JP Morgan Chase & Co., has been champing at the bit to break into the market. The New York-based banking giant succeeded in mid-October when JPMorgan opened its first Northern Nevada Chase Bank branch in south Reno in the Raley’s shopping center at the corner of Wedge Parkway and the Mount Rose Highway. But Chase won’t stop at just one branch. Another Chase branch is under development in the new shopping center at the intersection of South Meadows Parkway and Double R Boulevard anchored by Sprouts Farmers Market in south Reno and is expected to open in the first quarter of 2018. And if that’s not enough, three more branches are planned for the Lake Tahoe region later in 2018. Chase says it is very interested in the Carson Valley market as well. Chase already has a well-established presence in the state with 48 branches in Southern Nevada. JPMorgan Chase is also closely monitoring growth in Sparks and surrounding areas with intentions to open a handful of branches in that community in the near future. “It’s about placing ourselves in locations that make sense, not for ourselves today, but in the future as well,” Herron said. JPMorgan Chase is one of the oldest and most recognizable financial institutions in the world. Its legacy dates back to 1799, when its earliest predecessor was chartered in New York City. Its heritage includes 1,200 predecessor institutions including firms J.P. Morgan, Chase Manhattan, Chemical Manufacturers Hanover, and Bank One. Chase has total assets of $2.6 trillion and has operations in more than 60 countries worldwide. Chase’s first Northern Nevada branch on Wedge Parkway occupies a building that once housed a Taco Bell outlet. 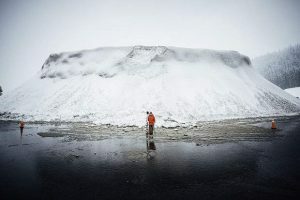 Company officials felt the Mount Rose Highway location was so good, they were comfortable with moving into an existing building that was already equipped with a drive-up window. Subsequent new locations, they said, probably will be built from the ground up. The Wedge Parkway location offers consumer, business and mortgage services along with at least one financial adviser on site. It employs nine people, including branch manager Michael Doray, vice president/private client adviser Joseph Tartaglini, private client banker Francisco J. Camacho, business relationship manager Vic Delossantos and personal banker Marie Hood. “At the other locations, we’ll have much the same staff methodology with regards to our staff,” Herron said. Future branches will be determined by studying neighborhood development patterns and road construction. That planning not only may take months but years because of the region’s rapid expansion. The branches will most likely be in highly visible shopping centers, making it conveniently accessible to clients. Branches also will vary in size and in services offered depending on the clientele who frequent the locations. The South Meadows branch will be about twice the size of the Wedge Parkway location. It will feature private conference rooms to be used for client meeting or training purposes. Future locations that appear to have heavier day-to-day traffic may also institute multiple drive-up ATMs. Herron said Chase’s emphasis on technology should give it a competitive advantage. Its ATM service, for instance, gives a lot of different denominations with withdrawal limits of up to $3,000 and has the capability to accept as many as 30 deposited checks or a stack of 50 bills per visit. Banking through smartphone technology also is becoming more and more prevalent, and Herron said it is imperative Chase be up to speed. Chase has no qualms about entering the Northern Nevada banking arena that is dominated by heavyweights Bank of America and Wells Fargo already well entrenched in the market, locally based institutions and a host of credit unions. In fact, Chase’s first location in the former Taco Bell restaurant already has those two banking behemoths nearby in the same shopping center. “It’s a rapidly expanding market, and there’s a need for consumer and business clients to have more options for banking services,” Herron said. 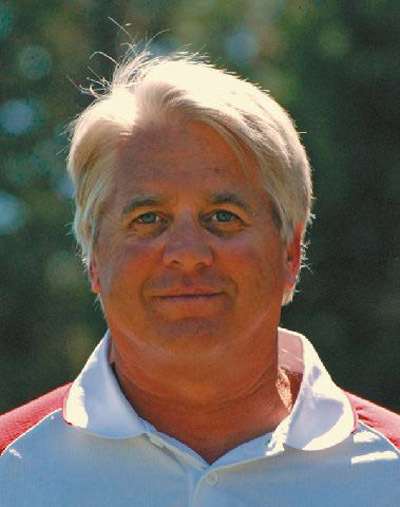 Herron declined to say what the immediately investment was to break into the Northern Nevada market; he preferred to highlight Chase’s involvement in philanthropic endeavors in the region. Chase has already become involved with local charitable organizations, including the Children’s Cabinet of Northern Nevada, Pride of Reno and the Humans Society of Northern Nevada. In January, the JP Morgan Chase Foundation awarded the State of Nevada a $2 million grant over a three-year period as a part of Chase’s global New Skills for Youth initiative. The program aims to assist students graduate from high school to be prepared to enter the workforce. Chase came to Nevada when it acquired Washington Mutual in 2008 and currently owns 1.47 percent of the deposit market in the state, according to a report released by the Federal Deposit Insurance Corporation (FDIC) last June. Chase is also ranked No. 1 in deposit growth in the United States for the fifth consecutive year, according to the FDIC. Last year, Chase’s total deposits grew by $96 billion to $1.31 trillion overall by June 30 of this year.